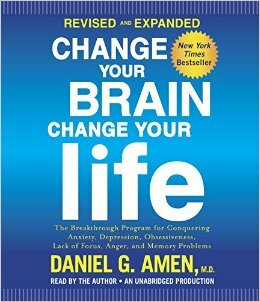 Change Your Brain Change Your Life – paperback by Daniel G. Amen, M.D. BRAIN PRESCRIPTIONS THAT REALLY WORK. Change Your Brain Change Your Life is a breakthrough program for conquering Anxiety, Depression, Obsessiveness, Anger, and Impulsiveness. In this bestselling program, you’ll see scientific evidence that your anxiety, depression, anger, obsessiveness, or impulsiveness could be related to how specific structures in your brain work. You’re not stuck with the brain you’re born with. Through his brain imaging work at the Amen Clinics with tens of thousands of patients from 68 countries over the last two decades Dr. Daniel Amen has come to understand that you can literally change your brain and change your life. This is one of the most exciting breakthroughs in medicine, because with a better brain, always comes a better life. Filled with “brain prescriptions” (among them cognitive exercises and nutritional advice) that are geared toward readers who’ve experienced anxiety, depression, impulsiveness, excessive anger or worry, and obsessive behavior, Change Your Brain, Change Your Life milks the mind-body connection for all it’s worth. Dr. Amen advocates natural remedies, including deep breathing, guided imagery, meditation, self-hypnosis, and biofeedback for treating disorders that are so frequently dealt with by prescription only. The good news is no matter how bad you’ve been to your brain up to this point in your life, you CAN make it better – and Dr. Amen will show you how.